Huh? Did you read that right? A handful for your diet. 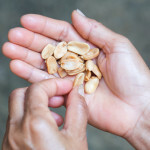 But according to some recent informal random comments on a post I wrote for HealthyWomen.org in 2011, people really did lose weight when they included peanuts in their diets. Because of their protein and fiber, peanuts and peanut butter will stick with you for about 2 1/2 hours vs. the half hour you’ll get from high-carbohydrate foods, according to one study. As you may or may not know, the new 2015 Dietary Guidelines for Americans (DGA) – whose focus this time is less on specific nutrients and more on eating healthier foods to improve your overall eating habits – has just been released. I’ll be writing more about the particulars soon, but since we’re on the subject of peanuts, they do play a role in those guidelines. Peanuts are part of all the healthy diets studied. Peanuts are one of the most nutrient-dense foods available. Most peanut products are minimally processed and low in sugar, saturated fats and sodium. When substituted for other snacks and proteins, peanuts and peanut butter improve nutritional status. Peanuts are convenient, affordable and portable. What’s more, a 2008 study that looked at various weight loss regimens found that there was greater compliance to the diet as well as greater weight loss in the groups who were permitted to include nuts. 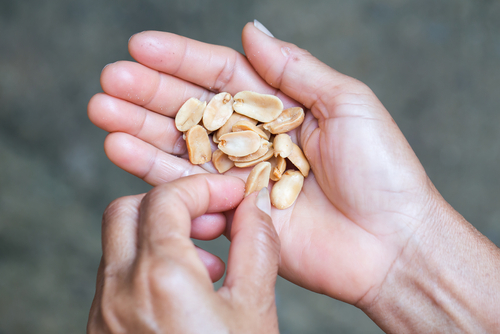 The Peanut Institute says that although peanuts are high in fat, that fat is mainly of the monounsaturated variety – which is a healthy fat that can improve blood lipids if eaten in moderation. But before you pile on the peanut butter or eat heaping handfuls of peanuts, which, in their defense, are energy dense, high in fiber and fill you up, keep in mind that quantities do matter. They’re caloric – and simply put, consuming too many calories can pile on the pounds. A handful – or an ounce – a day will do you. (FYI an ounce of dry-roasted peanuts contains about 166 calories). Off to the kitchen to grab my handful-for-the-day – how about you? P.S. I tried these peanuts many years ago and they’re among my favorites – delish! Sounds like a nice complement to New Year’s diet resolutions! I quite like readinbg through an article that ccan make men and women think. Also, thanks forr permittin me to comment!